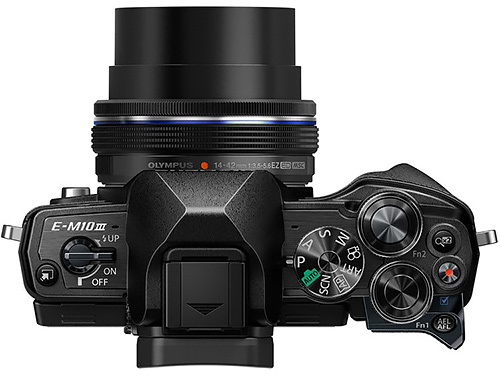 Olympus has announced the OM-D E-M10 Mark III, a compact, lightweight, easy-to-use interchangeable lens camera that includes best-in-class image stabilization compensation performance and the same TruePic VIII Image Processor used in Olympus' acclaimed flagship OM-D E-M1 Mark II camera. The user interface has been improved with a new Shortcut button on the left-hand side of the camera instantly displays the setting menu most relevant to the current shooting mode so you can quickly change settings. And two customizable function buttons can be programmed with one of 11 different functions, including Digital Tele-Converter for instant activation with a one button press. Two dials on the upper section of the body can also be used to change settings and make adjustments on the fly. 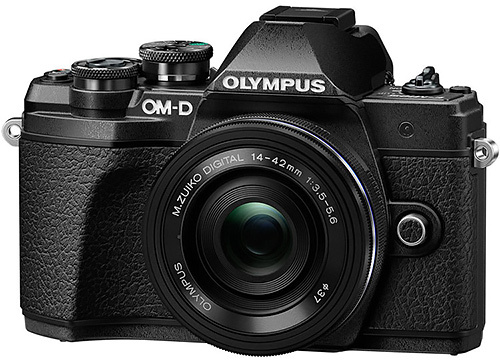 Olympus said the OM-D E-M10 Mark III will be available in a black and silver body or black body by late September for $649.99 (body only) and $799.99 with an M.Zuiko 14-42mm EZ kit lens. Adorama for the body-only option in black or silver and the kit lens configuration in black or silver. In addition, Adorama offers a First Look with Gavin Hoey. B&H for the body-only option in black or silver and the kit lens configuration in black or silver. CENTER VALLEY, Pa. -- Olympus' new OM-D E-M10 Mark III is a compact, lightweight, easy-to-use interchangeable lens camera that offers the performance and image quality of the OM-D lineup to the snapshooter looking to expand their photography. The OM-D E-M10 Mark III includes best-in-class image stabilization compensation performance and the same TruePic VIII Image Processor used in Olympus' acclaimed flagship OM-D E-M1 Mark II camera. This combination delivers high-quality images even in situations when camera shake typically causes blur, such as night scenes or handheld telephoto shooting. Consumers looking to step up from their smartphone camera to an interchangeable lens system will instantly benefit from the OM-D E-M10 Mark III's 5-Axis Image Stabilization. With an image stabilization system built into the camera body, it can provide blur-free images no matter which lens is attached and can also record crisp, shake-free handheld 4K videos in cinema-like quality. The camera is compact and lightweight to easily be taken anywhere to capture and share standout, like-worthy images on social media. Designed for ease of use, both in form and functionality, the grip rests nicely in the hand and buttons and dials are thoughtfully positioned for effortless operation. The body is equipped with a variety of features for different shooting styles and situations, including a high-resolution electronic viewfinder, a tilting rear LCD monitor with touch controls similar to a smartphone and a built-in flash. First-time interchangeable lens camera users benefit from four shooting assist modes to capture brilliant images right out of the box. The intelligent Auto Mode detects the shooting scene, subject, camera movement and light transmitted through the lens, then automatically chooses the optimal settings. The other assist modes include Scene Mode, Advanced Photo Mode and Art Filter Mode, each of which appear on the mode dial alongside AUTO Mode for easy access. The OM-D E-M10 Mark III is equipped with built-in WiFi, which can be used in conjunction with the Olympus Image Share (OI.Share) app to easily connect to a smart device and wirelessly transfer images for quick editing and uploading to social media. In-body 5-Axis Image Stabilization can deliver blur-free, high-quality images in any scene. The OM-D E-M10 Mark III is equipped with high-performance in-body 5-Axis Image Stabilization and the same TruePic VIII Image Processor used in the acclaimed flagship model OM-D E-M1 Mark II. These technologies combine to give users of all levels a camera that delivers improved performance in low-light shooting conditions and beautiful, blur-free images and movies in any shooting scene without using a tripod. Best-in-class, built-in compensation performance (four shutter-speed stops) provides pin-sharp photos with high image quality, even in situations where camera shake is prevalent, such as night scenes and dim indoor conditions and when using a telephoto lens. This powerful image stabilization system also enhances video capability, providing beautiful, shake-free handheld 4K movies. Compact premium OM-D design. The OM-D E-M10 Mark III has a sophisticated, compact and lightweight body that can easily be brought along on any adventure. The camera is optimized for ease of use, with an easy-to-hold grip and buttons and dials designed for easy operation. The camera is equipped with a variety of features for different shooting styles and situations, including a high-resolution electronic viewfinder, a tilting LCD screen with touch operations similar to a smartphone and a built-in flash. Four shooting assist modes for entry-level users. The OM-D E-M10 Mark III is equipped with four shooting assist modes so that first-time interchangeable lens camera users can shoot with ease. AUTO, Scene, Advanced Photo and Art Filter Modes appear on the mode dial for easy access. When in AUTO Mode, the camera detects the shooting scene, subject, lighting and movement of the camera and subject to automatically select the optimal settings to allow anyone to capture blur-free, pin-sharp photos, even in dimly lit indoor situations. In Scene Mode, users can touch one of six shooting environments, each displayed on the LCD monitor, to activate the ideal settings. The Advanced Photo Mode opens up users of all levels to popular photography techniques, such as nighttime Live Composite and Multiple Exposure. Bleach Bypass is a new filter in Art Filter Mode that reproduces the silver retention method used when developing film. Type I produces a glossy look, like shining silver metal and Type II produces a nostalgic look reminiscent of old film. High-speed AF performance with touch operation to capture any subject. The OM-D E-M10 Mark III is equipped with high-speed AF to instantly focus on fast-moving subjects and capture beautiful, sharp images. When using the Touch AF Shutter, users can simultaneously focus and release the shutter by simply touching on the tilting screen the area they want to focus on. The camera features 121 AF points that cover most of the image area, allowing you to easily focus on the subject. It is equipped with Face Priority AF and Eye Priority AF to ensure sharp focusing on the face or eyes of the person closest to the camera. Also available is C-AF for continuous focusing on moving subjects and up to 8.6 frames per second high-speed sequential shooting for capturing split-second expressions. Built-in WiFi for easy smartphone connection and sharing. The OM-D E-M10 Mark III is equipped with built-in WiFi that can be used in conjunction with the Olympus Image Share (OI.Share) app to easily connect to a smart device and wirelessly transfer images and video for quick uploading to social media. Simply scan the QR code displayed on the camera's screen with a smart device to pair the devices. A smart device can also be used as a remote trigger for shooting group photos and for adding GPS information to photos displayed on a map to indicate where they were captured. Shortcut Button for easy menu navigation. The new Shortcut Button on the left-hand side of the camera instantly displays the setting menu most relevant to the current shooting mode so that users can quickly change settings. For example, users can press the Shortcut Button while shooting in Scene Mode to quickly switch to another shooting environment. Easily accessible settings and adjustments. Settings are assigned to the four arrow pad buttons on the back of the camera, including ISO, flash, drive and focus settings, which can be activated with the press of the corresponding icon. Two customizable function buttons can be programmed with one of 11 different functions, such as Digital Tele-Converter for instant activation with one button press. Two dials on the upper section of the body can be used to change settings and make adjustments on the fly. 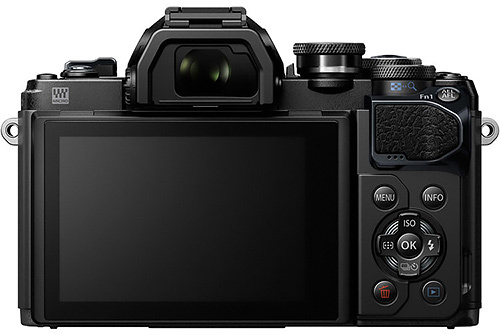 The Olympus OM-D E-M10 Mark III will be available in a black and silver body or black body beginning in late September with an estimated street price of $649.99/$799.99 CAD (body only) and $799.99/$999.99 CAD (M.Zuiko 14-42mm EZ Lens kit). For a complete list of specifications, visit the Olympus Web site: http://getolympus.com/digitalcameras/omd/e-m10-mark-iii.html.